Charlotte Nold is pastor of St. John United Church of Christ, in Chicago's Logan Square; board secretary and chairman, human resources committee for the Chicago Anti-Hunger Federation and a member of the Welfare to Work committee. She is a long time subscriber to The Round Barn Theatre. Responding to a recent article about Plain and Fancy at Amish Acres, Dr. Nold said, "It reminded me of how important it is in a large city to have a play like Plain and Fancy. Every time I see it, it grounds me in the reality of the incredible value of living more simply. I do believe that the world would be a more peaceful place if this were translated into many languages, for it simply addresses the issue of culture-awareness, and appreciating the gifts that each of us have to offer each other. When we live side by side and do not do that we create stress which can escalate into war. Please share with the cast that for some people, like me, in the audience, we actuallly mentally move into the scene and become part of the play itself. We have an opportunity to go back in time, and share an adventure that we would otherwise never experience. Theater is a wonderful adventure to help us to become more intelligent, understanding, and compassionate people. Thanks for all of your hard work and dedication." Rev. Dr. Charlotte Nold earned her ministry degree from Northern Baptist Theological Seminary in Lombard, Ill. and her master of divinity degree from Garrett Evangelical Theological Seminary, in Evanston, Ill. She is working on her PhD. in philosophy and church history from the University of Liverpool, England. Nold is the spiritual director of a large alcohol and drug recovery community living in half-way houses in Chicago. She is president of the Near Northwest Neighborhood Network Clergy Caucus; and on the steering committee of Friends of St. Paul's house (a senior citizens' complex). Nold works extensively with the deaf community and signs two gospel choir concerts a year. She has served as mistress of ceremonies of CAHF’s Sing Out Against Hunger for many years. Charlotte certainly didn't need to see A Christmas Carol, but as you would expect, she enjoyed every minute of it. How do you shingle a barn? Now that a second fan of this blog has been identified, I am emboldened to post even more obscure observations. To my knowledge we are reshingling the Schwietzer bank barn in the historic area of Amish Acres for only the fourth time since 1876. The original wood shingles were covered by five groove galvanized steel roofing at the turn of the century. 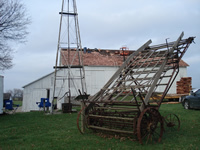 When the farm was purchased for preservation and restoration the metal and original shingles were removed. The second covering of wood shingles lasted until this year. Now they are being replaced in time for winter. When the carpenter crew exposed the slat sheeting I was reminded that the perlins are in place where the two original cupolas were supported. These cupolas were added to the barn for ventilation. They were likely removed when the metal roof was added. The slatted ventilators on the walls of the barn were part of the strategy of prevent fires that were started in barns filled with new mown hay that could create enough heat to ignite itself. After a number of decades it was observed that barns with ventilators burned as often as those without ventilators; therefore, an expensive practice installing a ventilator system in new barns became less and less popular. As you drive down a rural road you can bracket a barn's age by the inclusion or exclusion of architecturally attractive ventilators. Albert Kuhns told me during our initial restoration the the Prairie Farmer newspaper ran a contest back in the 1930's based on photographs of distinctive barns that readers were asked to identify along federal highways throughout the midwest and this barn was one of them featured. I have spent nearly 40 years looking for a copy of that issue without success. 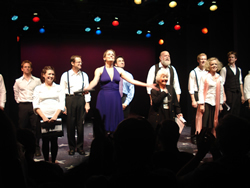 On October 28, 2006, the day Plain and Fancy closed its 20th anniversary season on The Joseph Stein Stage in The Round Barn Theatre at Amish Acres in Nappanee, Indiana, and the day before Fiddler on the Roof closed the 2006 Festival of Musicals that further included a staged reading of Rags and a second stage production of Enter Laughing, all of whose books were written by librettist Stein, producers Richard and Susan Pletcher were invited by Joseph and Elisa Stein to be their guests to see Plain and Fancy as the capstone of the Musicals in Mufti: The Fall 2006 Series at The York Theatre in St. Peter’s Theatre on Lexington Avenue in New York City. The York is the only theatre in New York dedicated to developing and fully producing new musicals and preserving neglected, notable shows from the past. It received a special 2006 Drama Desk Award for its “Vital contributions to theatre by developing and producing New Musicals.” Sweeny Todd, Pacific Overtures and Jolson & Company moved from the York to extended runs on Broadway and Avenue Q and Harold & Maude were incubated at The York. Plain and Fancy marked the 60th Mufti production, more than any other staged theatre concert series in the world. It is coincidence that The York dedicated its 2006 Mufti season, its 20th season and the first to a single librettist, to three of Stein’s lesser known works. Take Me Along, Carmelina, and Plain and Fancy, all overshadowed by Stein’s Fiddler on the Roof, were presented in concert format in mufti (muff’tee), in street clothes without the usual trappings, in five performances each over three consecutive weekends. Follow this link for the whole story. Following graduation from the University of Michigan, as many of her classmates rushed in a lemming like exodus to New York City where most of them will become highly skilled wait staff and bartenders awaiting their big break on Broadway, Margo Brenner began searching for a job in other lower profile but prolific markets landing a job as an intern at The Studio Theatre in Washington, D.C.
After her year’s contract was up, with girl Friday experience, and unemployed, she began to network through the connections she had made within the Washington theatre cadre. She learned of an upcoming production of the 1946 Pulitzer Prize winning political comedy—all political plays are comedic—State of the Union written by Howard Lindsay and Russel Crouse to be staged at the Ford’s Theatre. She spoke long distance to the California based director, Kyle Donnelly, and was hired over the phone to assistant-direct the show! I shall tell you about my reaction to Margo’s directoral debut in the theatre Abraham Lincoln often visited, once too often. 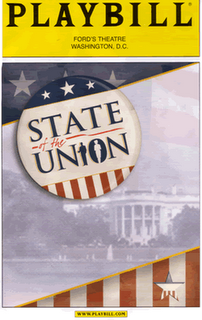 Attending State of the Union, at Margo’s invitation and with her parents was a thrilling and chilling experience for Susie and me. It was written on the heels of World War II where up until 1945 all Americans were pulling the same wagon to win the war. Following its conclusion it was back to politics as usual. The machine chose to groom and run a popular industrialist who made a lot of airplanes that gave the Allies air superiority during the war. The immediate problem became the potential candidate’s affair with a press agent and his estrangement with his wife, an untenable circumstance for a presidential candidate. The wife when approached with the idea of her husband running for president and the vision of her becoming the First Lady reunited the couple in a sham. The ensuing tale of deception, compromise, and manipulation of the candidate made the audience uneasy as it realized through the dozens of television monitors stacked on top of each other surrounding the proscenium that flashing 30 second sound bites from the first televised commercials up through Kennedy-Nixon, Ford, Carter, Reagan, Clinton, 41, and 43 that nothing has changed. When dark the screens receded behind a scrim of presidential slogans plastered on signs beginning with Lincoln. The message was not very subtle. That is both frightening and comforting; Frightening that the process is so conniving, yet comforting that since that war we have elected a Roman Catholic president, witnessed an assassination, had our civil rights extended through a relatively bloodless revolution, forced a law breaking president to resign, impeached another president for lying, and now taken congressional control away from a president who many view as being in denial of the events and challenges surrounding his office. Thanks in part to Margo, we realize our fabric in this flawed thing called Democracy is still in tact. The single known fan of this blog has been complaining about the dearth of postings. Lecturing Elderhostels, designing sets for A Christmas Carol, a trip to Washington, D.C. to see State of the Union at the Fords Theatre and New York to see Plain and Fancy, designing and moving the theatre’s costume shop and rehearsal studio, have taken my time and energy of late. Hopefully, reports of these events and projects can be added to this blog in the upcoming weeks. The rewards of producing musical theatre often seem outweighed by the risk; but there is a constant stream of alumni refining their careers post Amish Acres—207 actors in Plain and Fancy alone and uncounted artistic and technical staff are spread across the nation, many still attached to the performing arts world, which by the way is very small, while others have used their experience to launch new and unrelated careers. 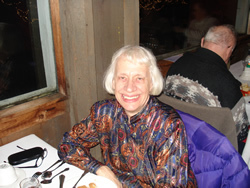 Margo Brenner was associated with the Round Barn Theatre at Amish Acres for seven years before graduating from the University of Michigan with a major in theatre. She served as house manager, props master, kid wrangler, assistant stage manager, and assistant director. Following an accident involving our guest director of The King and I, Margo stepped up from her assistant directorship to assume full responsibility for several scenes under the supervision of artistic director Scott Saegesser. She followed this effort with expanded responsibilities for scenes in West Side Story. Margo not only performed an ever expanding role with our theatre, but became so smitten with the art form that she wrote her first play, Not Only Time Will Tell, a two-act drama drawing inspiration from the recent Broadway revival of the musical and our earlier production of 1776. The play focused on the marriage and romance of John and Abigal Adams as preserved in their letters. Although her high school drama department is one of the most respected in Indiana, it understandably has little space for a budding playwright within its curriculum. Margo accepted her rejection to organize a reading of her play within the school’s department as a challenge—a prerequisite for becoming an author. She asked for space and time from us to stage her reading. From this reading performed by her classmates, like all authors, she found reason to revise. After a second revision, she finally convinced her drama teacher to let her produce her work on the school’s workshop stage. Margo’s drama friends were auditioned, cast, costumed, rehearsed and the curtain opened on her world premier with an audience of nearly 100. A standing ovation greeted the curtain call. We published her two-act play on our Website. I tell you this today because tomorrow I will tell you the next chapter of Margo’s journey into the world of performing arts.